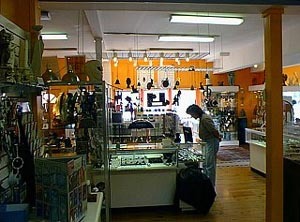 Here you can take a short tour of our store. Situated in the heart of downtown Salem, Massachusetts on Derby Street, we offer easy access as well as proximity to the many other attractions Salem has to offer. 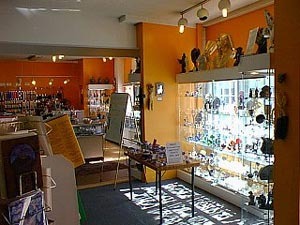 As you enter our store, you can see some of the many beautiful new age items we offer every day. We offer a huge selection of books covering all kinds of new age information, including books on: wicca, metaphysics, crystals, healing, bodywork, sacred places, ETs, UFOs, and much much more. Come and browse our wide selection of metaphysical jewelry, beads, gift items, tarot decks, runes, candles, oils, incense, audio cassettes, cds, and more. People all over New England make it a point to come to Salem and visit the Pyramid. You're invited come and spend some time in our friendly, sunny store. If you like, call ahead to book a 15 or 30 minute tarot reading, or ask about our new schedule of workshops. Take Interstate 95 North to Highway 128. From Highway 128, take exit 25A for Route 114 east toward Salem. Stay in left lane, follow Route 114 to Salem (about 4 miles). 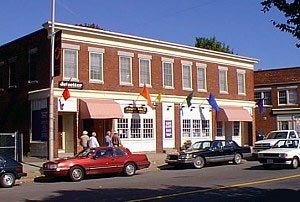 When you arrive in downtown Salem, look for the Post Office on the corner to your right. At the this major intersection, (Route 114 and Washington Street) go straight across the intersection onto Derby Street. Pyramid Books is halfway down Derby Street, past several museums, on the left side of the street. Open 10AM - 7PM seven days a week. 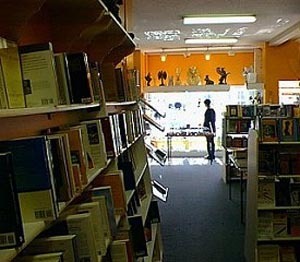 Return to the Pyramid Books Main Page.